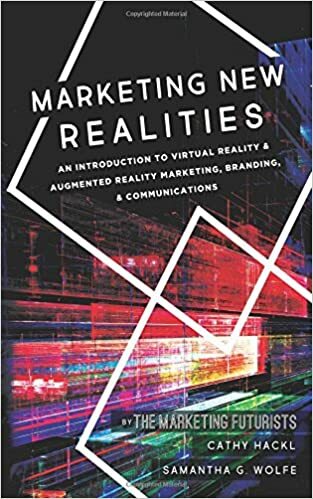 If there is one Social PR book you should read right now, it’s Marketing New Realities: An Introduction to Virtual Reality & Augmented Reality Marketing, Branding, & Communications. Not because I wrote the foreword. Not because I’m friends with one of the authors. The reason you need to read Marketing New Realities NOW is that if you don’t, life as you know it will change and you won’t know what happened. You’ll be lost. Skip over the topic of VR/AR and Mixed Reality (MR) and prepare to be less relevant in the 2018 public relations, branding, social media marketing world. Don’t get me wrong; we have so much to learn. This is just the beginning of one of those pivotal moments in marketing history. Like the Internet, website, email, SEO, social media, and now this: AR/VR/MR. As most companies know, search engine optimization (SEO) is an essential part of any marketer’s campaigns. SEO is all about organic reach. Get ready – AR will impact SEO tremendously meaning marketers and brands need to get on board and prepare for the AR digital tidal wave. Imagine: your potential customers will be able to walk on the street, pick up their mobile device or smart glasses and scan the street for information about what’s surrounding them. VR and AR’s birth announcement came out of social media powerhouses Facebook, YouTube, Instagram, Twitter, and Snapchat. These same companies are funding a large number of VR and AR advancements, beyond the just the hardware. Facebook is already merging social networking with virtual reality (social VR) by enabling users to use emojis to “like” 360-degree VR videos while wearing their headsets. This is just the beginning. Augmented (AR) and Virtual Reality (VR) can amplify your company’s media relations. While VR and AR have not yet commonplace, news about your organization embracing AR and VR can boost your brand. We used to send press kits, but soon we’ll pitch journalists and bloggers branded, exclusive AR and VR content. Ok so are you with me? The following is the foreword I wrote and originally printed in Marketing New Realities. There’s always the question: How early should we get to the party? The time is now. You are not too early. You are not too late. When you see what furniture looks like in your house without buying a thing. When you can dive the Great Barrier Reef in the comfort of your living room. When you can feel what it’s like to be an addict without ever taking a drug or drink. When you are sitting in a fashion show in Paris on your lunch break in New York. When you’re here, and your team is there. Empathy. Adventure. Education. Experience. Immersion. The virtual journey is now available to all. How can you capture this opportunity as a brand? From a perspective, never so readily available, by two authors – never so ready to take you there. Marketing New Realities. An Introduction to Virtual Reality and Augmented Reality, Marketing, Branding, & Communications by Cathy Hackl and Samantha G. Wolfe. I’m happy to make this introduction to the next generation of this marketing revolution. After watching public relations mature into digital and morph into social media; it’s exciting to see the revolutionary new view for you and your audience, a step out of 2D and into the possibilities of 3D and more. Hackl is joined by Wolfe, an award-winning marketing futurist specializing in emerging technologies. Together they peel back the complex layers of AR/VR/MR and simplify it into an actionable book with useful takeaways. Two global tech powerhouses, Hackl and Wolfe, deliver a chapter-by-chapter playbook of how and when to use AR/VR technology for marketing. Doses of reality mixed with a twist of inspiration and backed with stats and facts. It’s a cocktail of AR/VR success. Read this book, and infuse yourself with a new reality for tomorrow’s marketing. Most importantly, the who, what, where, when, and why to use AR/VR as a marketing strategy in one-size fits all package. They bring marketers the breadth and depth, cutting to the chase and filtering out the clutter. That moment when you need to determine what AR/VR means for your brand. The inevitable questions: How does your brand promise extend to this medium? Is it worth it? What kind of experiences will enhance and improve your marketing campaigns? How can you surprise and delight your audience in new ways never before possible? How can you make this happen? Hackl and Wolfe take you where you need to go. The journey is just beginning, and you are here. Let’s immerse in the future of marketing today.